It doesn't matter where in the desert you're traveling, you have at one time or another used a map. If it's in the desert, then it's probably a topography map. The X's, the Y shapes, the squares with the black angled fill, the circles, or the different dotted lines for roads. What do all the symbols on the map mean? If you spend even a short amount of time looking at these symbols it may help you some day while you're out looking for an old town (SITE) or a mine shaft / tunnel. Tunnels and caves, are shown differently on these maps than shafts are, do you know the difference? 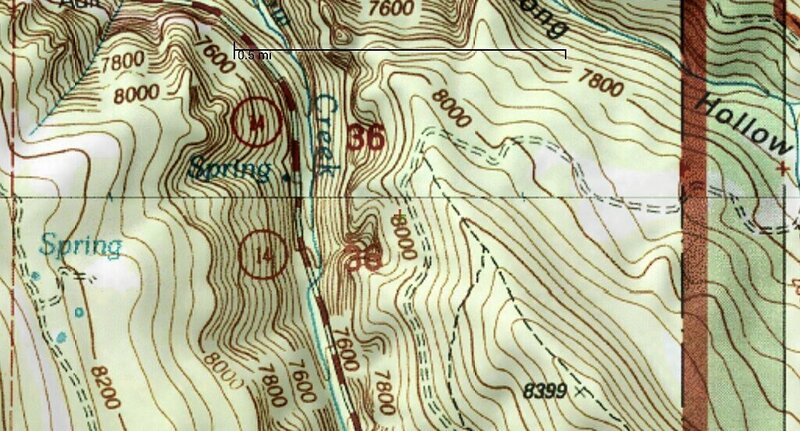 Not all topo maps are the same, some have more info than others, but most have symbols and most use the same symbols. We'll make this as simple as possible and not get into all the different symbols, just the ones you're most likely to run into in the desert. Primary Highway, Interstate, State Routes, Turnpikes, Freeways. Also shown here is a Secondary highway (dotted red / white line). Hard surface (paved) road connecting towns, etc. Light duty roads (solid lines) may or may not be paved, but are considered all-weather roads. Unimproved roads (dotted lines) may not always be passable. 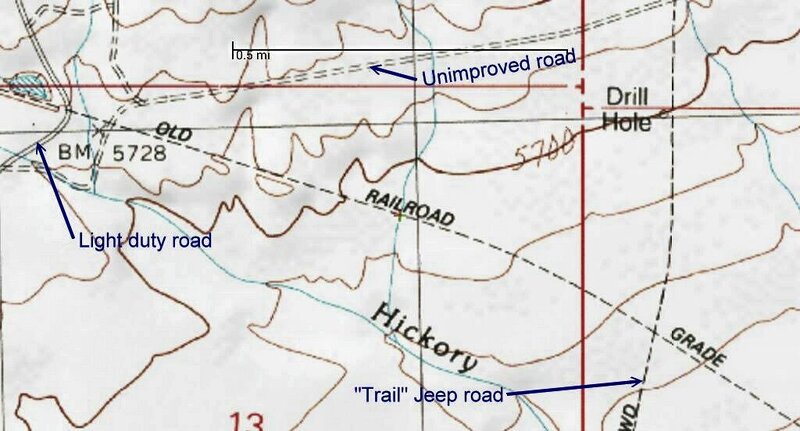 Trails, 4WD, Jeep roads (single dotted line) may be rough and impassable, this also includes old railroad grades as shown on map. Often seen on topography maps are these symbols which look like mining picks. They represent a quarry or open pit mine. Don't confuse them with the gravel pit symbol shown here. Gravel pits are also shown as inverted shovels. 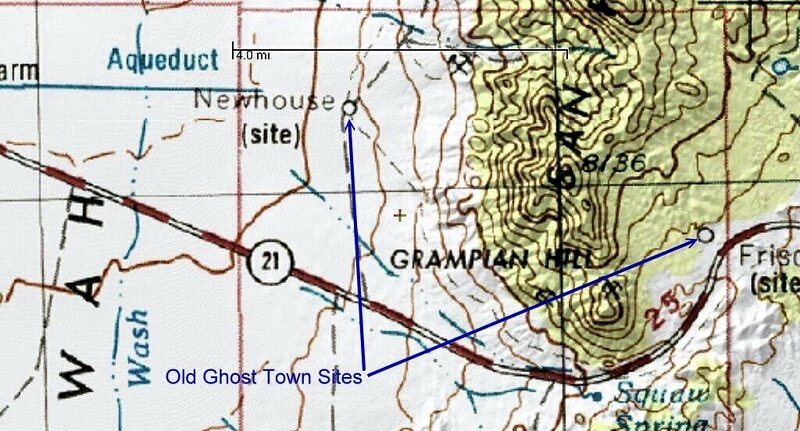 Ghost Towns, Sites are shown as landmarks (circle "O") whereas buildings would be shown as rectangular boxes. Campgrounds are usually shown as a teepee or picnic table, and a tank is shown as a round circle filled with black color. See below for more. Here are two common symbols for an airport and another one for a landing strip. To the right of the town of Milford you'll see the symbol for a railroad. 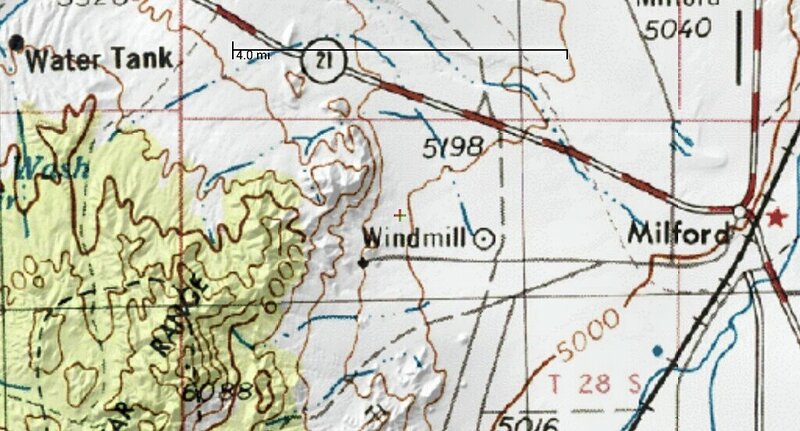 Also note that on this topography map there is a water tank and a windmill. These are fairly simple to figure out, the large light blue area is the reservoir and the same color lines are creeks, rivers, or as is the case in desert areas, many times these will be dry wash beds which will only have running water during rain storms. 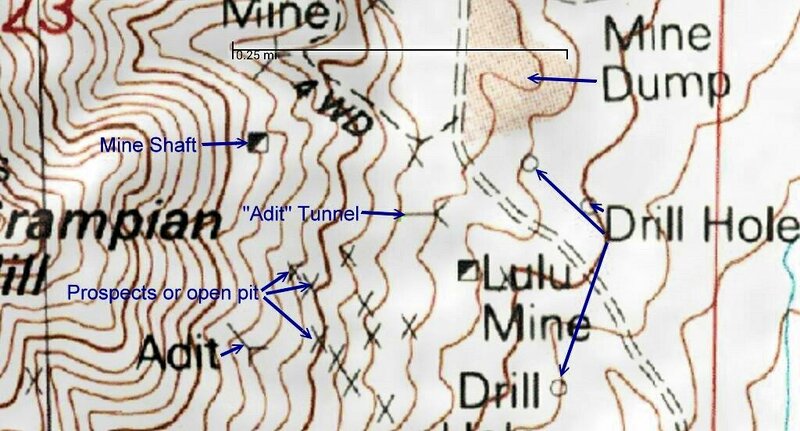 In the enlargement - note the thick black line showing where the dam is located. Elevation lines and the numbers you see embedded with them tell what the elevation is above sea-level. These grade lines will become more apparent the more that you zoom in on the map. Not all topography maps have such clear and concise elev. lines as this one does. This map is also a good example of road symbols. See the enlargement. 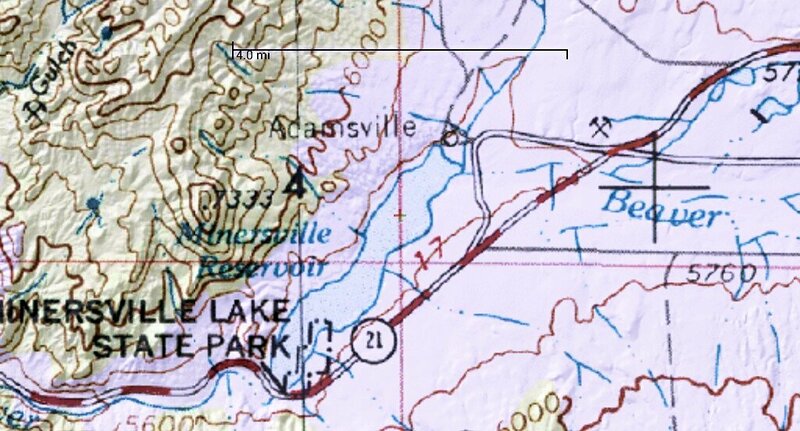 The map system used for the above examples were the Cal topo US 24K topography maps available in the BackCountry Navigator APP for an Android tablet. A lot of other digital map systems won't have many symbols on the maps. Of course you can see the disadvantage to that. Regular USGS topography maps for the most part do have symbols on their maps. This should help when you run into these symbols on your topography map. Some of these symbols are obvious, others are not. If you like searching for old mines, ghost towns and relics then this should be helpful. After seeing this you may want to consider a smart phone or a tablet in place of a GPS unit. There are a lot of different map systems available. We'll try to help you decide which one is perfect for you.